BEECHER, Ill. (WPVI) -- A 6-year-old boy died after a crash in Beecher, Illinois that killed his pregnant mother and two younger brothers. 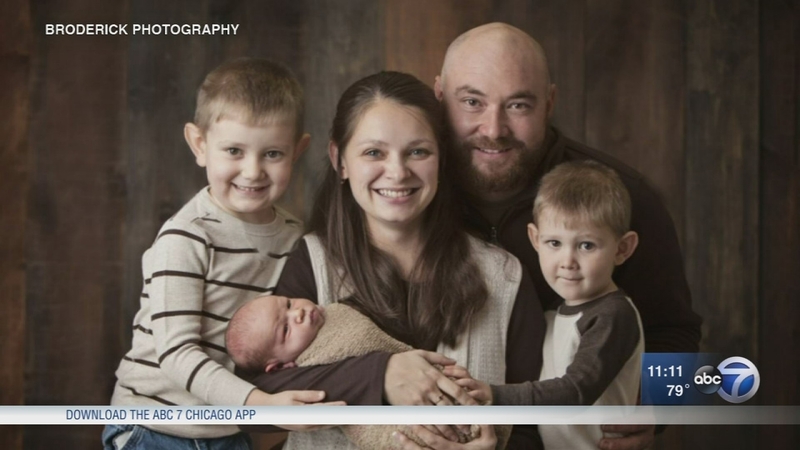 WLS-TV reports, Owen Schmidt died at Comer Children's Hospital at 2:39 a.m. Thursday, the Cook County Medical Examiner's Office said. Owen's 29-year-old mother, Lindsey Schmidt, and his 21-month-old brother, Kaleb Schmidt, were killed in Monday's crash. His 4-year-old brother, Weston Schmidt, succumbed to his injuries Tuesday evening. Family and friends gathered to pray for the family Wednesday night. The tight-knit community of roughly 5,000 wanted the Schmidt family to know everyone is thinking about them. "We are just so heartbroken," said Crystal Johnson, who lives in Beecher. The family was only one block from their Beecher home when the crash occurred. Lindsey Schmidt was taking her boys to bible camp when they were hit, the sheriff's office said. Police said the 25-year-old driver of the truck that hit them is being treated for an injury to his arm. The 2002 Chevy S10 pickup was traveling eastbound on Corning Road and failed to stop at the stop sign. Schmidt was driving a 2014 Subaru Outback, heading north on Yates Avenue. She did not have a stop sign. Investigators are trying to determine if the driver should face charges and will examine his cellphone to determine if he was texting when the crash occurred, Will County Sheriff's Department spokeswoman Kathy Hoffmeyer said. The driver's name hasn't been released.